Everyone is cordially invited to the opening of a special exhibit "The Life of Joseph Peter Kazickas" in Pasvalys. 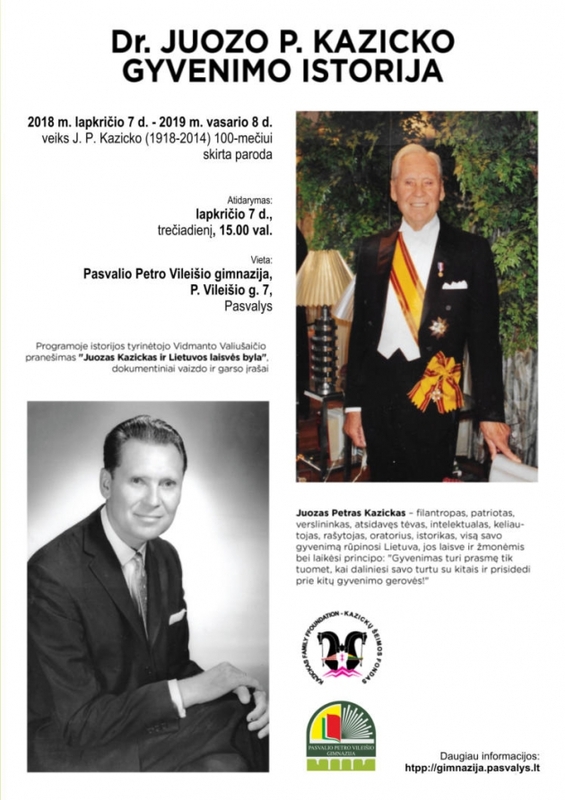 Exhibit about Petras Vileisis gymnasium graduate, philanthropist, patriot and businessmen will be introduced on November 7th at 3pm by dr. J. P. Kazickas' daughter Jurate Kazickas. The Kazickas family is pleased to present this special 100th year anniversary exhibition on the life and times of Joseph P. Kazickas (1918-2014) philanthropist, patriot, and businessman here in Pasvalys, where, in 1925 in nearby Geltonpamusis, the Kazickas family settled after their return to Lithuania from Ciornaya Padina in Russia. In a tiny two room house Joseph’s father had a small shop that sold herring, coffee and spices and was also the local post office. It became a gathering place for the community to talk about the latest developments in the country. That little house still stands and some years ago, Kazickas visited it with his children, pointing out the small stove and the ledge where he slept on cold winter nights to stay warm. There is a Kazickas family plot in Salociai cemetery where his parents are buried. J.P. Kazickas graduated in 1937 from Pasvalys gymnasium where he earned high grades and was a member of the track team. He first came back to Pasvalys in the fall of 1997 with a mission to equip the school with computers. The next year, his old school celebrated his 80th birthday with songs and tributes, and the opening of the JPK Computer Lab with 10 computers. Now, the school has two Computer labs with 30 computer stations and participates in the national Computer Programmer’s contest, launched in 2001 by J. P. Kazickas in partnership with KTU. Born in Ciornaya Padina, Russia where his Lithuanian ancestors were exiled after the 1863 uprising against the Tsar, J. P. Kazickas spent most of his life in the United States with only 20 years in Lithuania, but never lost his love for his homeland. He lobbied for its freedom during the dark days of the cold war, rejoiced in the re-declaration of its independence in 1990 and worked hard to bring economic prosperity to the Lithuanian people. Kazickas lived a very full life. Arriving penniless in the United States from displaced persons camps in Germany in 1947, he received a doctorate in economics from Yale University in 1951 and went on to become a successful entrepreneur. 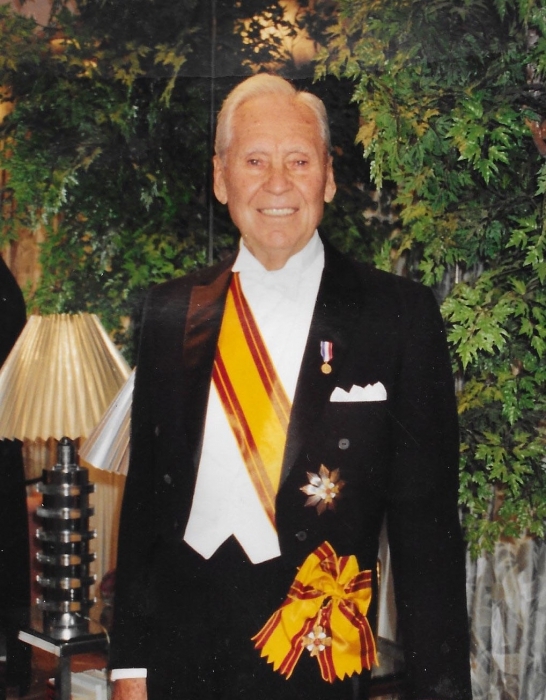 He raised five children with his wife, Alexandra, traveled the word, forming friendships with people at the highest levels of American and international society, and became a generous donor to many Lithuanian causes. 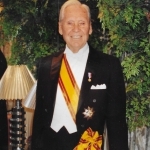 He established the Kazickas Family Foundation in 1998, which is his greatest legacy to the Lithuanian people. KFF has supported more than 100 charitable causes, including the computerization of public schools, the reconstruction of important architectural sites, the publication of numerous books on Lithuanian history and promotion of music and dance festivals that showcase the country’s rich traditions and culture. During the exhibition opening, history researcher Vidmantas Valiusaitis will present the theme "Joseph Kazickas and Lithuania's Freedom Case" where he will cover main aspects of Dr. J. P. Kazickas' life and his dedication to Lithuania. Vidmantas Valiusaitis is a journalist, publicist, editor, author of few books and many articles discussing politics, culture and history and currently is also Adolfas Damusis Democracy Center at the Martynas Mazvydas National Library director. Special exhibit continuing its travel through Lithuania will settle in Pasvalys Petras Vileisis Gymnasium (P. Vileišio g. 7) till February 8, 2019.